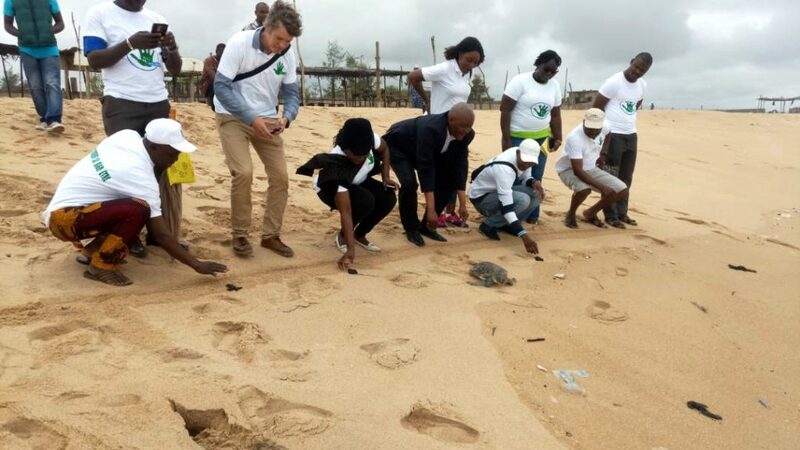 Benin’s Ministry of the Environment and Sustainable Development is leading a new national project for integrated marine and coastal management. The GIZMaC (Integrated Marine and Coastal Zone Management) project in Benin, is one of the three Mami Wata pilot projects currently being implemented in West Africa. Nestled between Togo to the West and Nigeria to the East, Benin has a 125 km long coastline, where half the country’s population is settled, and where a broad range of human activities – maritime transport, mineral extraction, fishing, tourism – contribute to 70% of the country’s GDP (8, 476 billion USD in 2015). Facing a rapid demographic growth and an over-exploitation of natural resources, Benin’s coastal area is also facing increasing threats to its marine biodiversity and to the many ecosystem services it provides for the local populations’ livelihoods and health. The coastal area of Benin is home to a diversity of endangered species such as whales, dolphins, and sea turtles, which are facing loss of breeding grounds, nesting sites and habitat. Other threats to the ecosystem include mangrove deforestation, coastal erosion, and climate change, leading to a loss of biodiversity, as was shown in 2007’s National Report on Benin’s marine and coastal environment. Given the complexity of the involved human activities, these threats call for a systemic approach to coastal environmental protection and for an integrated management of the marine environment. In order to combat these issues and promote ocean sustainability, innovative solutions that prevent and mitigate detrimental impacts to the marine environment are essential. In this context, Benin’s government is implementing a legal framework which includes a law on the environment, another law on the fisheries and aquaculture, the adoption of the law on the protection of the littoral, and the adoption of the law on the use of non-biodegradable plastic bags. Moreover, many other actions are being implemented such as the cleaning of the 125 km of coast, as well as sustainably securing and developing beach tourism. The sustainable management and valuation of the marine ecosystem constitute a major point of the 2017-2021 Government Action Program. One of the program priorities includes “improving the living environment for the people”. 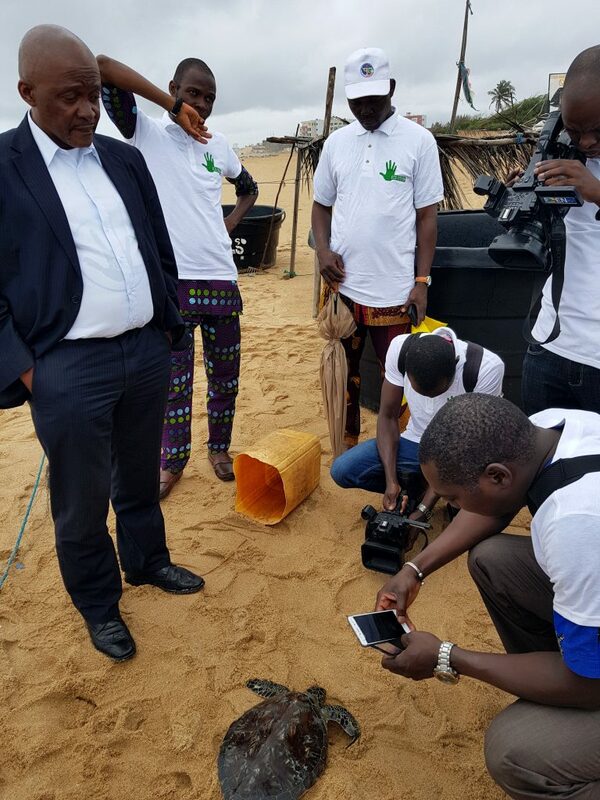 With the aim to safeguard Benin’s marine environment, and as one of the three Mami Wata Pilot Projects, the GIZMaC project was launched September 7th 2018 in Cotonou, during a workshop attended by maritime experts, local authorities and government officials. The project is funded by the German Ministry for the Environment, Nature Conservation and Nuclear Safety‘s International Climate Initiative (IKI), and implemented by Benin’s Ministry of the Environment and Sustainable Development (MCVDD) in collaboration with other Beninese ministries, with the technical support of GRID-Arendal (Norway) and the Secretariat of the Abidjan Convention. The project’s main objectives include: Improving the governance framework of the marine and coastal zone through Marine Spatial Planning (MSP); assessing the state of the marine and coastal environment in Benin, through State of the Marine Environment (SoME) reporting; identifying two Environmentally and Biologically Significant Marine Areas (EBSAs); and enhancing project governance, capacity building, and communication. “I would like to thank the Beninese Government for its collaboration, especially the MCVDD who will lead the project. Within the next two years, the successful completion of GIZMaC will set a framework for ensuring healthy oceans and will support long term economic and social development, food security, as well as maintaining Benin’s cultural identity, and its special relationship to the sea” said Christian Neumann, Program Leader at GRID-Arendal. “We hope this pilot project will inspire other countries of the Abidjan Convention to emulate Benin and work towards their national IOM” added Richard Dacosta, Executive Secretary of the Abidjan Convention. As for the General Director of the Environment and Climate, the project will contribute to the sustainable management of Benin’s marine ecosystem and the achievement of the Government Action Plan objectives. The next steps of the project are the implementation of the activities linked to the SoME and EBSA processes.